Long days and studying hard won’t save you from poverty in South Africa. 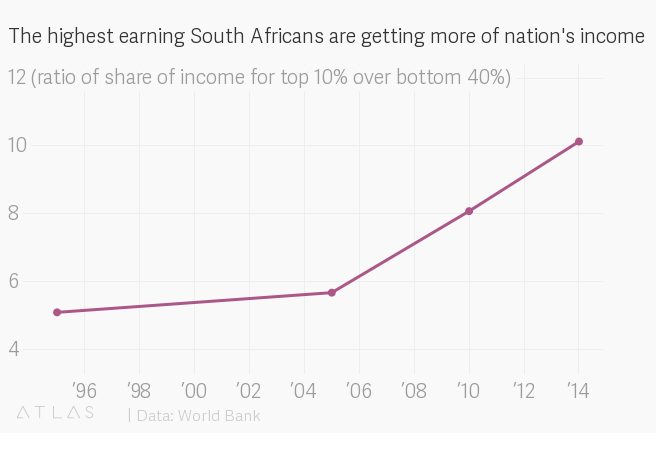 South Africa often feelslike two different countries chafing up against each other—one for the rich and one for the poor. This separation was legislated under apartheid, but post-apartheid South Africa has struggled to bridge the divide. Today, the disparity in education, skill, and income continues. Two recently released World Bank reports further show that the gap is not only widening, it is intergenerational. The circumstances that exacerbate South Africa’s inequality are both historical and a result of years of policy uncertainty, making it harder for ordinary South Africans to claw their way out of poverty. More than half of the population already lives in poverty, and a further 27% of the population live in a state of susceptibility to poverty. These 27% are referred to as the transient poor by the World Bank in it’s report “Overcoming poverty and inequality in South Africa.” On the other hand 20% of the country can be considered middle class, while only 4% of the country is considered elite. In comparison, Mauritius’ middle class is nearly 80% of the population. South Africans in the top-earning income bracket earn nearly five times more than the average low skilled jobs, according to the report. That disparity creates a gulf of two economies in one country, where top earners’ wages are comparable to developed countries, while wages on the lower scale are akin to those in impoverished countries. Much of that gulf is due to differences in education levels. The middle class has particularly suffered from South African economy’s inability to create new jobs. To achieve a significant reduction in the country’s unemployment rate, the World Bank estimates 600,000 jobs would need to be created every year. The economy is producing half that number. Most of the new jobs are in the services sector, while low-skill agriculture and manufacturing jobs are on the decline. 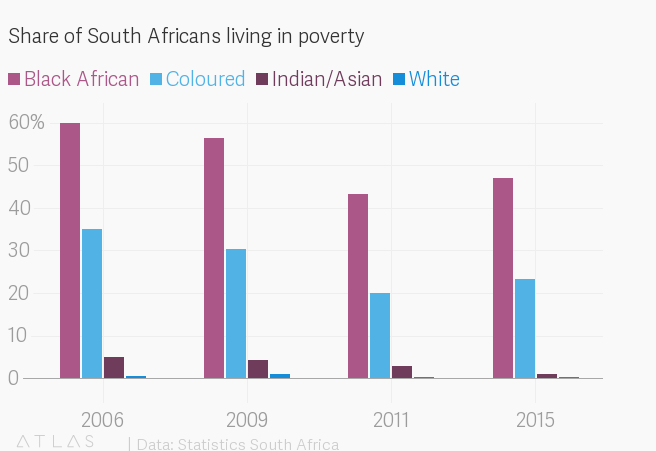 Unemployment disproportionally affects black South Africans, perpetuating apartheid’s inequality. When identifying who “the poor” are, the profile has remained the same before and after apartheid. Two fifths of sons born to very poor fathers will never get out of the the bottom 40% of the next generation’s income distribution, according to World Bank’s South Africa Economy Update (pdf). The chances of a boy born into the bottom 20% of the income distribution even reaching the top 20% for one year are slim, at just over 16.2%. Nearly 43% of boys born into the top 20% reach those heights. Post-apartheid economic policies have been unable to find a balance between job creation and economic growth. During the Mandela years, the country tried the Reconstruction and Development Program, which focused on social security but the program was costly and was not able to broaden the tax base. Then there was Growth, Employment and Redistribution, which tried to stimulate growth and reduce inflation and the deficit, but failed to create many jobs. It unsuccessfully depended on a trickle-down effect to grow the middle class. The Accelerated and Shared Growth Initiative for South Africa (ASGISA) was a compromise that aimed to halve unemployment in 10 years, but implementation was hindered by political power playing. Its replacement, the New Growth Path and the current National Development Plan languish under the same lack of political will. These policy decisions have created a so-called “missing middle” in various sectors of society which is becoming increasingly dissatisfied. It is glaring in South Africa’s higher education. 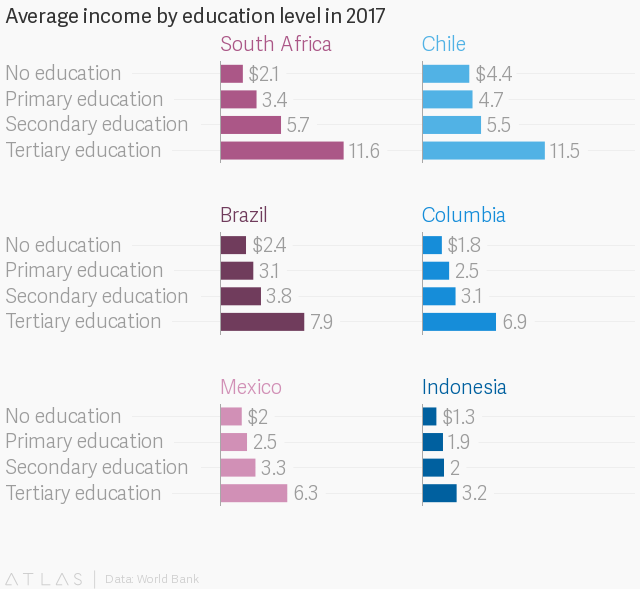 Categorized as households who earn less than 600,000 rand per year ($47,800), the students who make up the missing middle don’t qualify for national assistance, but they simply can’t afford to pay tuition. They made up the thousands of young people who created the #FeesMustFall movement, and they are overwhelmingly black. Only 5% of black students are likely to graduate, compared to 15% in 1975. In contrast, the number of white graduates had increased slightly during the same period. While the reports show inequality is most pronounced in the labor market—through income, education and, skills—it is impossible to remove contemporary circumstances from the country’s history. Inequality and its effects still disproportionately affect black South Africans, especially women. While some previously disenfranchised may have escaped poverty, the country’s inability create jobs and find a sustainable solution means the ranks of the impoverished are swelling far faster than those able to climb out.